The miracle of watching a puppy being born and the stages that they go through before they are ready to go home is a wonderful mystery. I don't have it down to an exact science, but below are a few things I've noticed at certain times in their maturing process. Maybe you can find where you're puppy is at, this week. 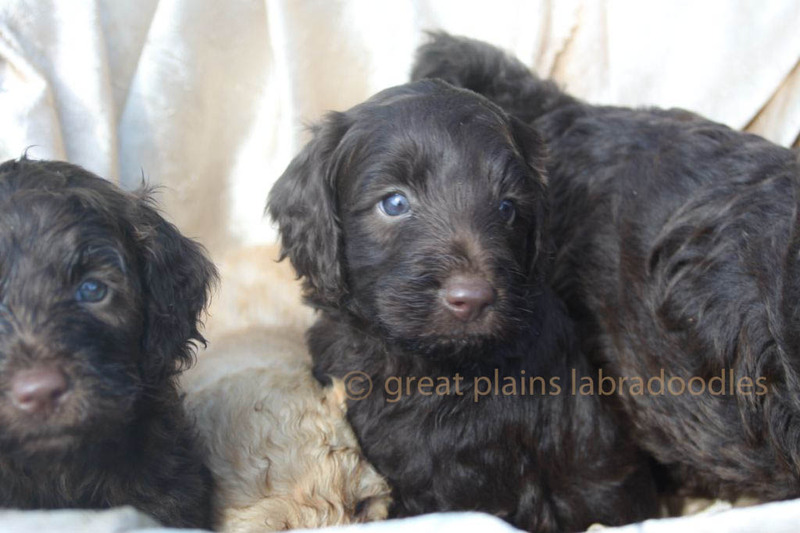 Australian Labradoodle puppies are just the same as any other puppies in terms of puppy development. To get you in touch with what has gone on in your puppies’ life before you meet him/her, here’s a list of developmental events that happen in the puppy’s life so you can be familiar with ALL that has happened until they are ready to come home. From conception to birth is approximately 2 months. 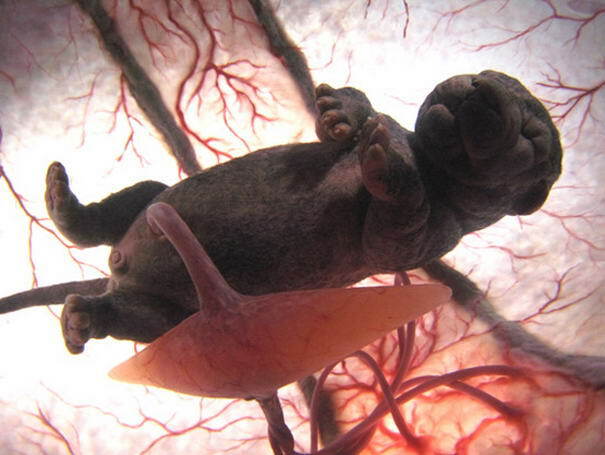 Puppies can be felt in the abdomen as early as 26 days. Weight gain can be noticed at around the 5th week but obvious by week 7. 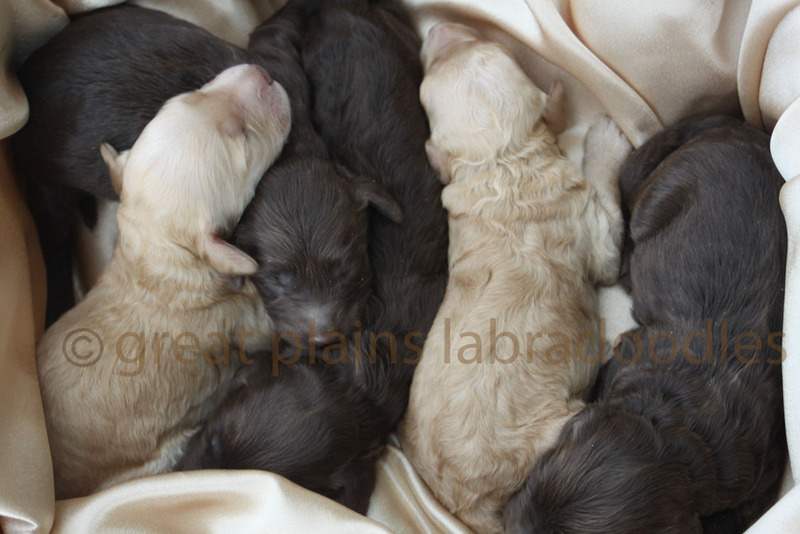 The mom’s nutritional needs greatly increase to keep up with the growing puppies. By week 8, the mom may become restless and begin “nesting”. Generally, milk is produced a day or two before delivery. We feed our mother dog puppy food during this time because of its high protein and energy levels. We continue with the puppy food throughout her period of nursing. During the last few weeks of gestation, we introduce the mom to her whelping box. This is the place where it will be clean and quiet during her whelping time. It will also be the place where the puppies will be for the first few weeks of their life. The box allows the mom to get out and run at her leisure, yet keeps her puppies safe. Puppies cannot regulate their own body temperature, so they need mom to keep them consistently warm or artificial warmth, like a heating pad or heat lamp. They need stimulation from mom to remove their wastes. Their senses of touch, smell and taste are all present at birth. They have a strong sucking reflex. Puppies grow when they are sleeping. Puppies double their weight within a week after birth. 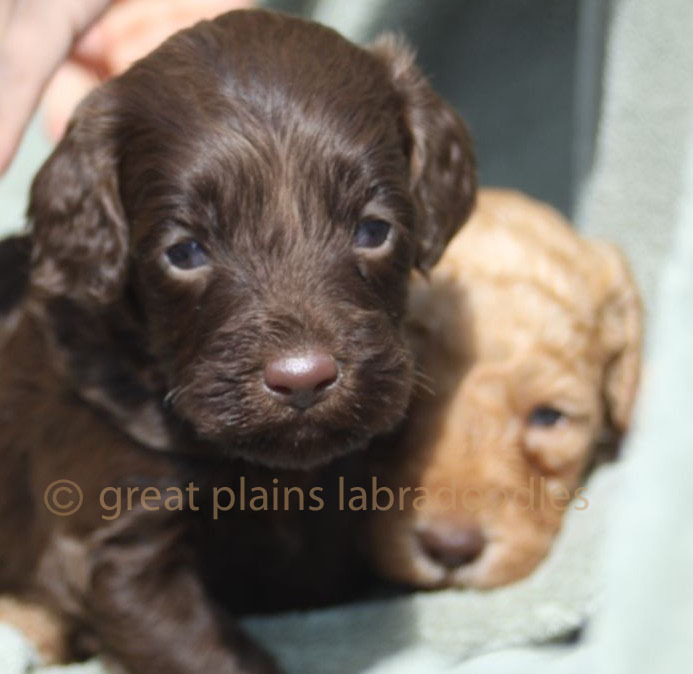 Puppies’ eyes open between 10-14 days. Puppy’s ear canals open between week 2-3, but will take a while to fully develop. 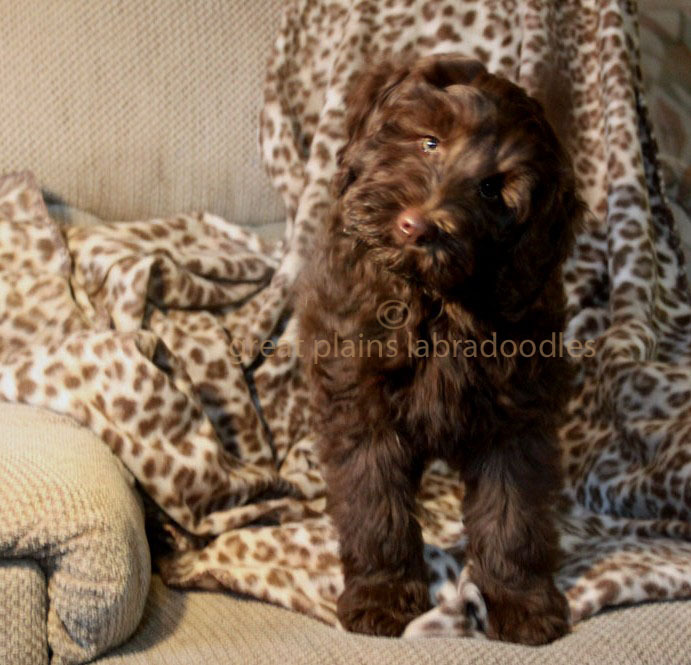 Puppies are a little more active and are wobbly and teeter when they stand up. Puppies are getting their teeth. Puppies are offered mushy food during the 3rd week and we have given solid food in 4th week. They drink water but continue to nurse. They growl, nip and begin to be playful. They wag their tail and start barking. They are becoming very expressive. The puppies continue to need mom for their social skills, but also learn from their littermates. Mom will gradually spend more and more time away from her puppies. Eyesight and hearing are fully developed. Puppies seem to be “fearless” at this point – driven by curiosity. They receive their first vet exam, de-worming and vaccinations. 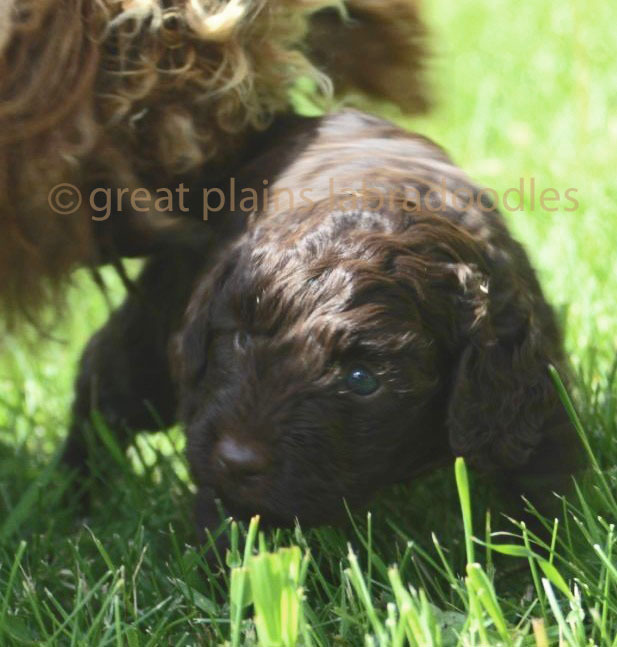 Puppies are refining their coordination and can begin to housetrain. Puppies are released to move to their new homes with their new families. There is rapid learning during these weeks. Puppies can appear increasingly cautious. So, puppy needs positive training and reassurance during this time. Avoid harsh voices and harsh discipline at all times, but especially during this time in your puppy’s life. Puppies will use their basic instincts to explore. Puppies will still sleep a lot and continue to grow as they sleep. If the puppy is stressed, puppies can raise the hair on their neck and back. Puppies need to be aware of your rules. Puppies will follow you around. Puppies respond to their name and generally come when called. Potty training is much more reliable. They are learning about their environment and learn to avoid being stepped on. Permanent teeth are coming in. Puppy will be testing your authority during this time. Puppy is in the chewing stage - have toys handy!